We initiated the HAW lesbian group in the winter of 1971–72 and by the summer we found ourselves stuck between cozy sociability and theoretical ambitions. As a result, I and some other lesbians felt the urge to move the feminist cause forward. 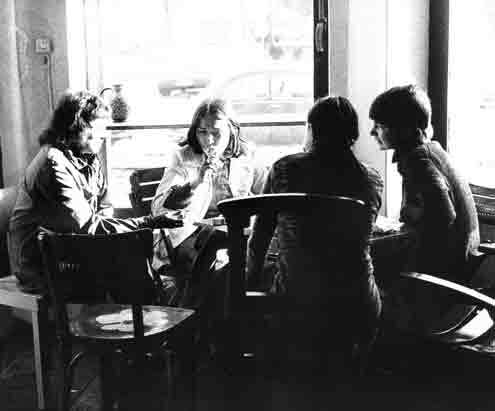 In November 1972 Waltraut Siepert—my girlfriend at the time— and I placed an announcement in the magazine Hundert Blumen (Hundred Flowers), the successor to Agit 883, calling on women to come together at the Socialist Center on Stefanstrasse in the district of Moabit to found a women’s center. We found the appeal in Hundert Blumen, an alternative magazine. The appeal went through the various little groups like a whisper race and it was obvious that we would be there. We wanted women to organize as women. So about 70 women from various informal contexts attended the first meeting. I remember that first evening as incredibly exciting. I had never seen so many women together in a room without men trying to structure everything. The first thing we did was arrange plenary meetings and subgroups, all of this done standing up because there were so many of us, and from then on we were ready to work. We simply skipped the step of a theoretical platform, which was a must in other groups. Even before this meeting there was a consensus, so that we didn’t need a lot of discussion, because all of us had the same experience with left-wing groups behind us. In November 72 a number of women came together through an advertisement. We all wanted to do work for women, but were seeking an alternative to the Socialist Women’s League of West Berlin (SFB). The SFB is inimical to praxis, hierarchical and oriented towards the SEW,[i] bureaucratic and anti-feminist. We immediately formed the first working groups: university, sexuality, early childhood education and consciousness-raising groups. In March 73 we had finally rented premises for a women’s center where we could counsel women, sell books and hold group meetings. All of the women from the subgroups attend the weekly plenary. There they share their experiences from the groups and everybody discusses and decides on actions proposed by the subgroups. In this way we are constantly and collectively developing the women’s centers’ self-understanding. We therefore do not have any written positions, but are learning together. Every Thursday delegates from every working group come to the office group, where we deal with organizational matters and conduct a preliminary discussion of pending issues for the plenary. Afterwards, at 8 pm, there is an information event for newcomers every week. We do not side with any political party, but we support the work of the neighborhood committees, “Rote Hilfe” and the gay women. For example: On May 1 there were three different demonstrations in Berlin. We did not support any of the competing parties, but on that day we occupied a square – Richardplatz in Neukölln – for a children’s festival together with the neighborhood committee. We didn’t really think so much in terms of structure; that had its good sides, because it meant that people who weren’t used to opening their mouths dared to speak up. After all, the students were all better talkers. – I had the feeling that people listened to one another, so that even ordinary housewives felt they could express their opinions. – In order to avoid having to start at square one every time, we founded the newcomers’ plenary, where we introduced ourselves and the new women could integrate into the groups, then things were fine. – Yes, enjoyably chaotic; things sorted themselves out. – Very little structure was needed for things to work. What I [Cristina Perincioli] find amazing is that we never had a discussion at the women’s center about the proper line to take. The women came from different contexts, anarchists, lesbians, PL/PI, Rote Hilfe etc and everybody immediately agreed about what the center should be like. I cannot recall any discussions about the proper line. And I think that applied to some of the women’s centers in other cities as well. How do you remember that? – At the Film Academy and probably at the Institute of Psychology where you studied too the students were feuding day and night over who was right. – But we argued at the women’s center too! – yes, but it was never about using your knowledge to impress others, though, and we never had abstract ideological discussions. The women dispensed with knowing the right path to revolution, or rather with aspirations to revolution altogether. They simply wanted to tackle the issues that got them fired up. These were very diverse areas, but it was always about the desire to make changes that could be expressed directly, and that in some cases were also attainable. There were groups working on the situation of women at Berlin’s universities and teacher training college (PH); women working in early childhood education also had their own professional group. There was a sexuality group, consciousness-raising (CR) groups, a prison group, a media group and of course a §218 group, which did abortion counseling, organized trips to Holland and campaigned against the law. All of these groups did both theoretical and practical work and engaged in self-reflection. Strategy discussions were based solely on our own successes or failures and not on nineteenth-century texts, as was usual in the Socialist Women’s League of West Berlin (SFB) and the other dogmatic leftist groups. The plenary at the women’s center became incredibly important for me emotionally. For the first time I saw women taking themselves seriously, making themselves the subject of political practice, having the guts to make demands on their own behalf without hiding behind the working class. Usually people talked about medical problems, about §218, and many of my own difficulties, which I had never realized were political, related to that. In early June—to the horror of all “old” women’s center women— the Socialist Women’s League of West Berlin (SFB) met in the plenary room at Stresemannstrasse 40. Ten center women hastily assembled by telephone managed to clarify that this was a one-time visit made possible by ignorance of the groups’ differences. Was it truly a grassroots democracy? I know that there were endless discussions about many matters, we didn’t just vote. Sometimes we sat there until two in the morning, we were always supposed to reach a consensus. That was great because we learned how to use arguments. There were only a few people who did things differently, like Alice Schwarzer. I encountered more rigid structures among the anarchist women. The more radical somebody was, the more she had to say. There was insane pressure to always do an action right away with no chance for discussion. We were often out and about at night from the women’s center too, but I always felt like I was in good hands with those women. 1 women’s rock band Flying Lesbians, which occasionally drives women wild, especially because women’s parties quickly become very popular. 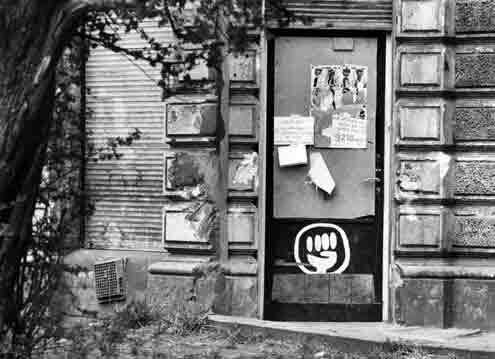 [i] The Socialist Unity Party of West Berlin (SEW) was the West Berlin branch of the Socialist Unity Party of Germany (SED) in the GDR. [ii] Anja Jovic, “Ich war getrennt von mir selbst…” Kursbuch 37, “Verkehrsformen,” vol. 2: Emanzipation in der Gruppe und die “Kosten” der Solidarität (Berlin, 1974), 67–83, 75. [iii] Jovic, “Ich war getrennt,” p. 74.